I really envy old people. Somewhere along the line, they get to this stage where they can tell you how they feel about just about everything and not care whose feelings they hurt. Thus, gamba rehearsals were starting to become bittersweet. The lady who very graciously allows me to come to her house and play with her posse while certain regular members are in absentia was starting to get me down. Don’t get me wrong, I know my playing is bad: I’ve only just started to practise again, am having lessons but not able to do so regularly and my instrument still has a few technical teething problems. However, I love playing so even though I know the organiser will ‘sledge’ me in front of everyone (by all means, criticise but do it in a constructive manner), I still go because I need the experience and there isn’t exactly scores of folks to jam with. 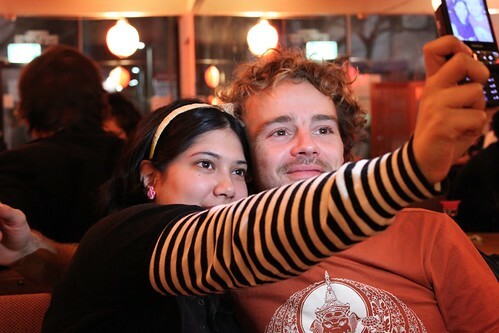 Tristan knew all of this, so he consented to treat me to dinner near the rehearsal venue. 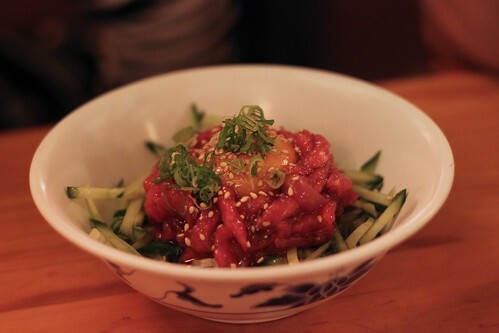 Despite getting a good sashimi fix at Matsu Hashi recently, my craving wasn’t fully sated. 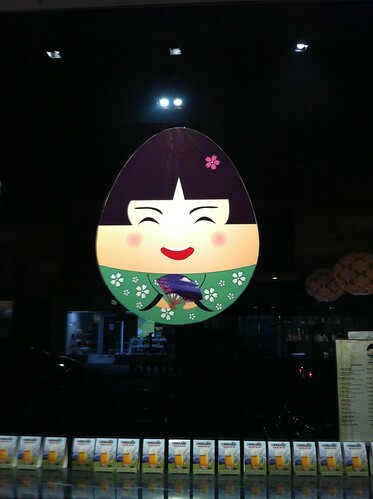 He suggested we try out a place in Camberwell called Daruma Japanese Kitchen. Again, someone still loves you, Urbanspoon. I lugged in my instrument and Tris was already there, with liquid refreshment. 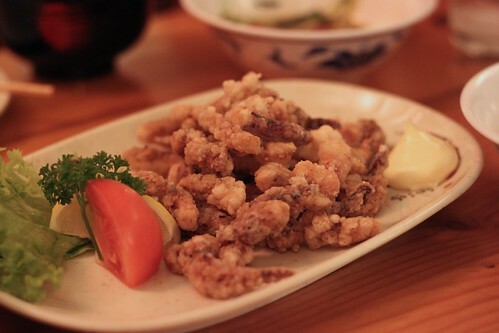 They have several sakes to choose from and also have a shochu list. 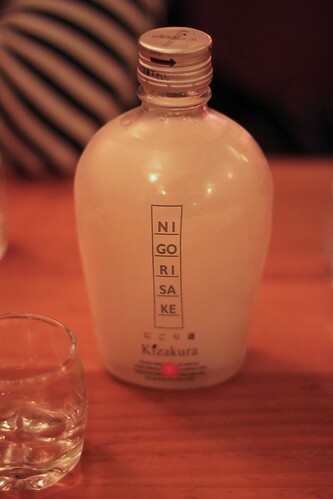 Throughout the course of our dinner we ordered three small flasks of sake (large is also available) – Bishounen Junmai Ginjo (smooth, a little fruity, 15% ABV), Kizakura Yamahai Jikomi (semi-dry with a rich body, 15% ABV) and lastly Nenihi Junmaino sake (dry with a mild, rich flavour, 16.2% ABV. Only available in a small flask). The bracketed descriptions are directly pinched off the menu. All of the ones we had were served cold and staff even recommended we wait for particular ones to cool for longer. 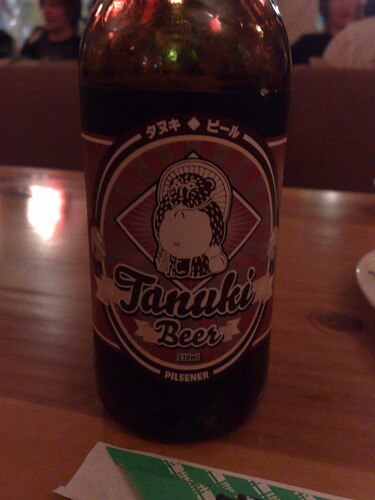 My guess is they know their sake, excellent! 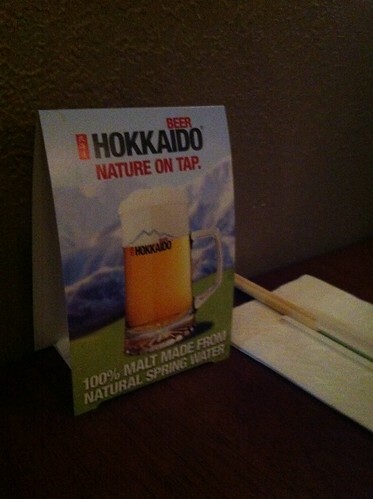 It was unusual, however, to not be drinking beer, especially when signs all about us were telling us that Hokkaido, Japan’s most northern island, is nature on tap: who can resist such a catchy slogan? 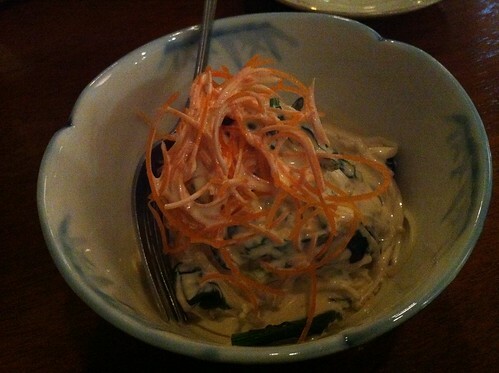 We shared two starters, firstly horenso and enoki mushrooms, cooked spinach with enoki mushrooms in a sesame dressing. They may have neglected to mention that it also had Japanese mayonnaise. Win! 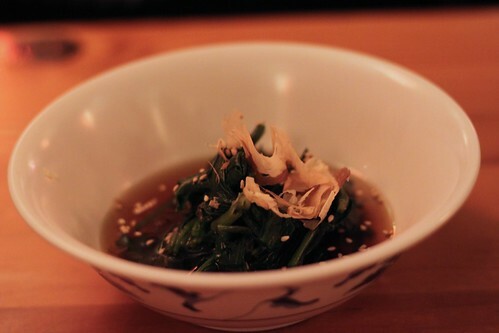 The enoki isn’t highly visible in this photo but it was plentiful. 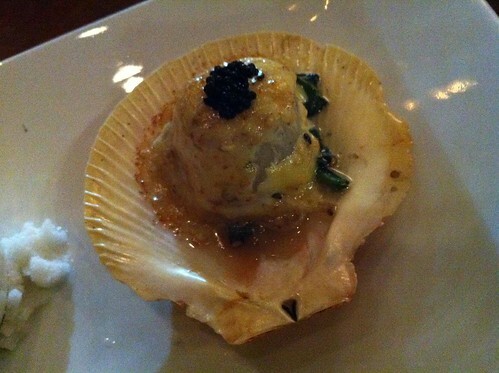 The second starter was scallops cooked two ways, one grilled, one crispy and topped with caviar. It looked impressive and we were both at a loss as to how to divide it and spoil its presentation. 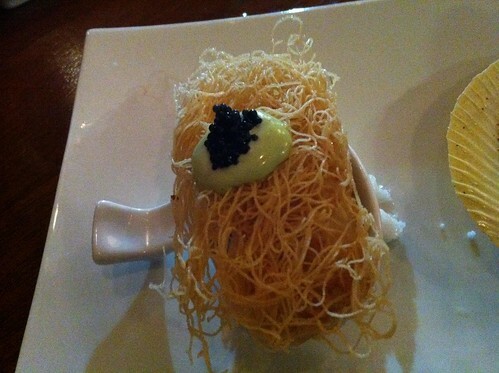 The crispy one was rather sculpturesque. The one in the shell less so, but still highly elaborate. Both were enjoyed greatly. I would probably suggest getting a serve each rather than sharing – it’s definitely worth it. 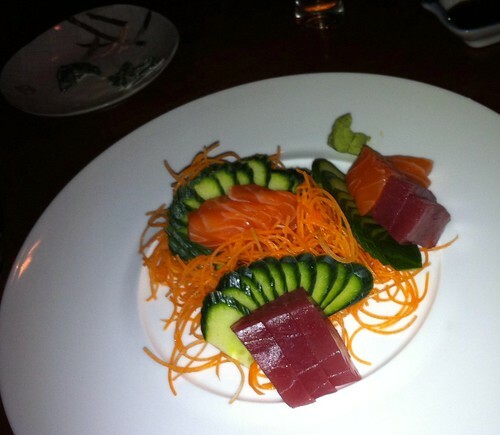 My main was a no-brainer; remember, I was here to get my raw fish craving killed. 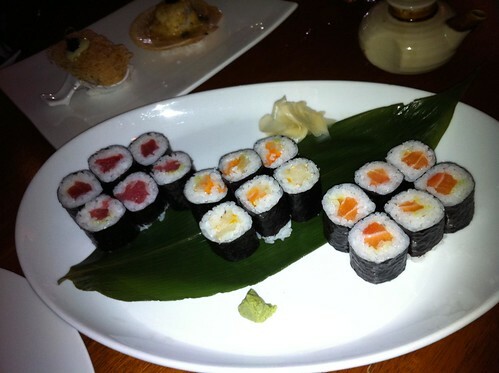 I decided upon the tuna and salmon sashimi and augmented this with maki – tuna, salmon and oshinko. 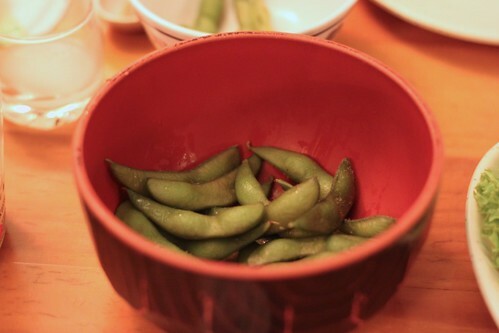 Um, I think the maki may have been the gut-buster…silly me. 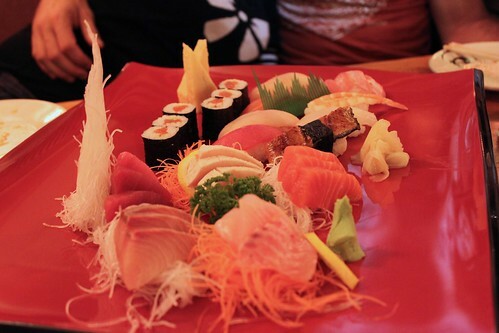 After eating the sashimi, I was left wondering why this place wasn’t packed to the gills (ha, fish pun!) – by comparison, Matsu Hashi was a blip on the raw fish radar. Their fish was exquisite. 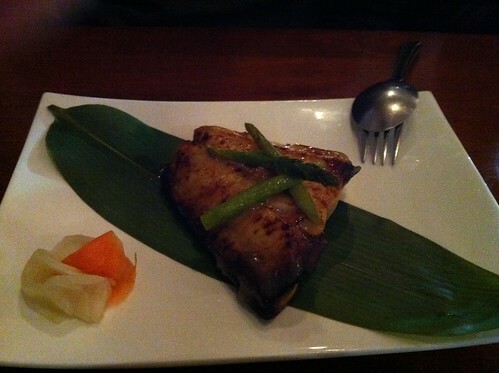 Tristan chose the most exciting main on the menu – the grilled black cod with yuzu miso. It doesn’t look particularly special but once in your mouth, a completely different story. Ack! Rehearsal time. Tristan told me I could head off while he settled up and thus I headed into the night, towards my personal Bermuda Triangle, that damned Camberwell Junction. The restaurant was pretty quiet the evening we dined though it was Monday. 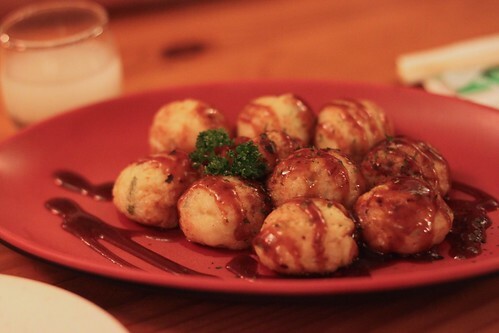 It definitely deserves more patronage as it serves excellent Japanese food as well as drinks. 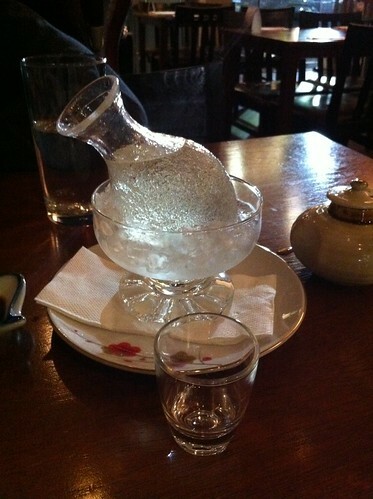 I will be back to make my way through more of their sake and sample their shochu. This entry was posted in eatie-foodies dining out, what has gone before and tagged Camberwell, Daruma Japanese Kitchen, Japanese food, Melbourne, sake, sashimi, seafood, sushi on September 12, 2011 by gem.